The figure is 25% higher than a year ago and is set to shatter forecasts for how many text messages have been sent to and from handsets this year. That weekly total is the same as the number sent during the whole of 1999. 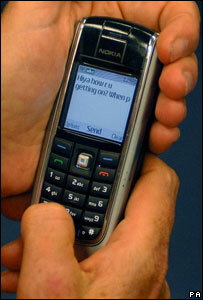 Some 4.825bn texts were sent in September 2007, equivalent to 4,000 every second. "It has exceeded our forecasts quite significantly," said Mike Short, head of the MDA. The total for 2007 looks set to reach 52 billion, he said. This was far in excess of the 42-48 billion the MDA previously predicted would be sent this year. Mr Short said there were several reasons for the continuing growth. "It's convenient, comprehensive, it's on every handset and network and it is cost effective," he said. Once despatched, a text message is stored on the mobile network until it can be delivered to its intended destination. How did we manage before text someone asks? Quite easily old chap - we just got on with life without the need to communicate every few minutes. So peaceful. That effective guarantee of delivery was perfect for many messages that may not merit an entire conversation or that people did not want to trust to voicemail. Many people were also happy to get news and updates about topics or teams they follow via text messaging. But increasingly, said Mr Short, companies were making use of text messaging. "It's a lot more convenient for a business now to notify lots of their employees about an urgent message using a text message," he said. At the same time many other companies were using text messages to manage relationships with customers when deliveries, appointments or house calls were due. "The UK text volumes show no real signs of abating and the UK sits within the top six of the global league of countries sending text messages," Mr Short went on. "While the trend towards operators offering 'all-you-can-eat' tariffs increases, this will act as a catalyst for consumers' passion for all things mobile."